kmcamera has no other items for sale. Thank you! They work perfectly! Great headphones. Super fast shipping. Prositive!!!!! Great quality! Fast shipping! AAAAAA+++++++. Fast shipping. Highly recommend. A very nice item & super-fast shipping! Very nice sounding headphones. Slightly warm with a little goose on the bass. These are not neutral. A lot of people consider them superior mixing and mastering cans. The ATH-M70x fits that bill more properly. Less coloring and very neutral. I run flac files through my DAC, into my Aric Audio fully balanced tube preamp and then into my headphone amp and these things sound spectacular for the price. Got mine for $92 shipped. Lots of people sell these in like-new condition. Very nice headphones. The design makes it easy to use with one ear without wearing the headphones. It also sounds very good when just listening to music and not monitoring. Sound quality is excellent. Totally recommend. I also have Sony MDR7506 and Sennheiser HD280 Pro. These ATH-M50x have the best sound by a good margin - percussion is especially good, small details of a complex mix come through clearly, and bass and treble are well balanced without needing any EQ adjustment. I've never tried high-end audiophile headphones, so I daresay if you spend twice as much there might be something better out there. 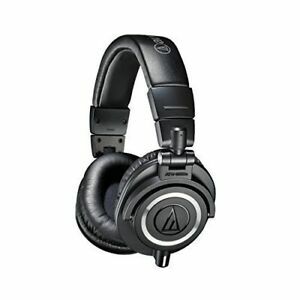 But at about $95 lightly-used, or $130 brand new, these are really really good, and allow you to hear a lot more detail in whatever music you like. I am beyond impressed. I ordered the headphones and within 2 days they were at my door. The packaging is beautiful, very organized and protected. The product is worth every penny. Great quality, easy to use, long lasting warranty and free shipping. Not to mention 35% cheaper than retail! All in all, I am more satisfied with this purchase than I have been with any other company I've used for anything! Thank you audio technica, thank you Sweetwater!